My last two finished objects in 2006 were Sivia Harding's Diamond fantasy shawl (I need to block it so pictures will be up sometime next week) and these December socks made out of Yarn Pirate clementine merino yarn. This yarn was a little thinner than Koigu KPPPM and tightly spun, it was wonderful to knit with. I can picture a beautiful shawl with some of the almost-solid yarn that Georgia dyes. I knitted them toe-up with a Turkish cast-on (see here for a very good tutorial) and an afterthought heel (using Lucy Neatby's book "Cool socks, warm feet"). No need for waste yarn or a crochet chain for the toe, you just knit a cylinder and place some waste yarn where the heel will be. Knitting an afterthought heel is just like knitting a toe: a few decrease rounds and you get to try the sock on to make sure the heel is deep enough and fits snuggly. It works especially well with self-striping yarn since you get a bulls eye pattern for the heel and even stripes for the leg and foot. You just have to be careful not to get holes (as usual!). 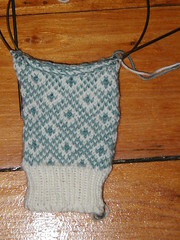 My first project of 2007 is a fair isle project since that was one of my knitting resolutions after the KR retreat. Eunny Jang pitched her Endpaper mitts as the perfect first fair isle project and she's right! The pattern is very clear and I am enjoying color knitting a lot more than I expected... I keep the white yarn with my left hand (scooping it as in Continental knitting) and the blue with my right hand (throwing it as in English knitting), it took a bit to practice but this should pay off in the long term. To fair isle experts (that's you, vi!! ), here's my question: am I supposed to hold the background color in the left or right hand for the pattern to stand out? Cute socks! Can't wait to see your shawl. oh wow! you know how to fair isle already, i am so jealous! i like those socks, they look so happy and cute. 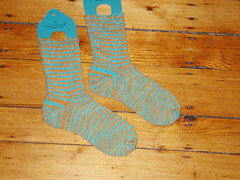 I envy anyone who can make socks!! Just give me the yarn and no one will get hurt!